THE LATEST offering in SeraCare Life Sciences’s range, SeraCon Vitamin D Depleted Diluent is a human plasma-based matrix for the development of vitamin D assays. The product is derived entirely from human plasma, with no equine or synthetic plasma, which the company says makes it extremely valuable for manufacturers of in vitro diagnostics. Clinical demand for vitamin D testing is increasing worldwide, says SeraCare, adding that this product meets the needs of the most sensitive test methods, being certified <1ng/ml Vitamin D2/D3 based on LC-MS/MS and immunoassay testing. 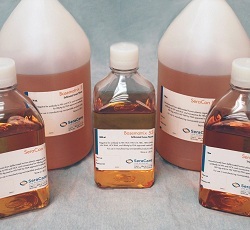 “SeraCon Vitamin D Depleted Diluent enables manufacturers to greatly improve their vitamin D assays, and will help our customers bring new testing products to market”, said Nicole Loranger, associate product manager, SeraCare Life Sciences.